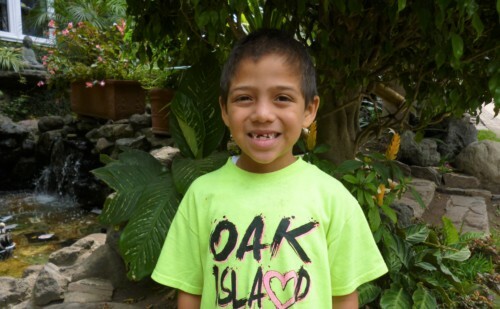 Roberto lives with his parents and one sister in a two-room house built of block with a cement floor. His mother is a housewife. His father works in construction and earns about $200 per month. Roberto likes to listen to music, especially reggae. His favorite color is red and he likes dogs. His goal is to get good grades and pass his grade this year. His favorite class is mathematics. He would like to be a electronic technician because he likes put things together. Juan lives with his mother and four siblings in a small house made of block and cement floor in San Felipe a small place near Antigua. The mother is separated from her husband because of some family problems and the mother now takes care of her children and does not have a full time job because she needs to take care of her children. The children´s grandfather helps her with a little money for their food. 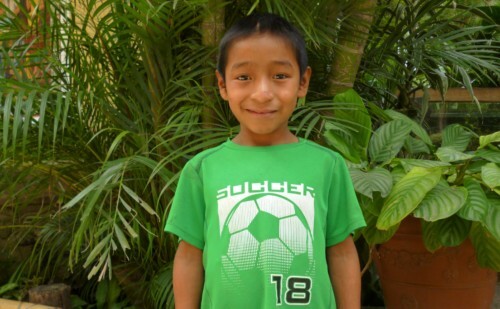 Juan likes to play soccer with his friends and to listen to reggaeton music. His favorite animal is the rabbit and he likes the color red. He plans to study a lot this year. His favorite class is English. He wants to be a doctor someday so he can help many people. Hanniel lives with his father and brother in a small one room house made of sheet metal and wood with a dirt floor. His father is currently unemployed and the family has scant resources. Hanniel likes to play and to watch TV. He likes Christian music and monkeys. His favorite color is blue and his favorite class is art. He would like to be a math teacher someday. This year he wants to learn Spanish. Luís lives with his parents and one sister in a one room house built of laminate and wood with a dirt floor. 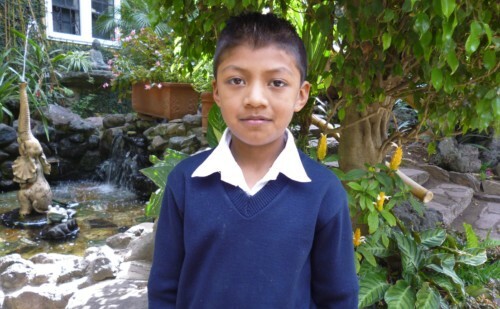 His mother cleans houses and his father works in construction, earning a combine income of less than $200 per month. Luís likes to play with cars and his favorite color is red. He likes Christian music and dogs. His favorite class is communication and language. He would like to be a doctor someday so he can help people. His goal this year is to be first in his class. Jony lives with his parents, two brothers and two sisters in a 3 room house built with laminate and cement blocks with a cement floor. His mother cleans houses and his father works in construction. Together they earn less than $300 per month. Jony enjoys painting and drawing and he likes reggaeton music. He like favorite color is red. He likes baby chicks. His goal this year is to get good grades and to pass to the his grade. His favorite subject in school is learning shapes and letters. When he grows up, he would like to be a police officer so he can help people. María lives with her mother, her grandmother and a little sister in a one room block house with a cement floor. Her mother cleans houses and earns about $200 per month. María like run with her friends and to listen to reggaeton music. She likes rabbits and her favorite color is pink. She plans to do study a lot and have good grades. Her favorite class is paint. 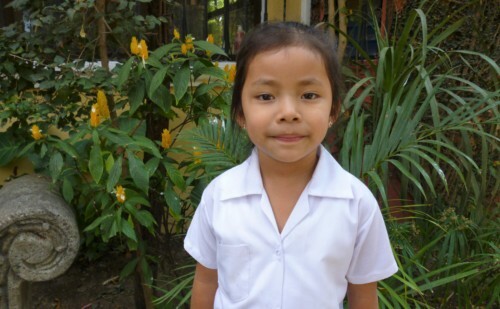 She would like to be a doctor because she thinks it would be nice to help lots of children. Victor lives with his father, brothers and sister in a very small and poor house built with sheet metal and covered in plastic. It has a dirt floor. His father is a day worker and earns less than $200 per month. The family has very scant financial resources. Due to the poor condition of the house, the children are exposed to cold and dust and are frequently sick with colds. Victor likes to run. His favorite color is green and he likes dogs. He likes reggae music and his favorite classes are penmanship and drawing. 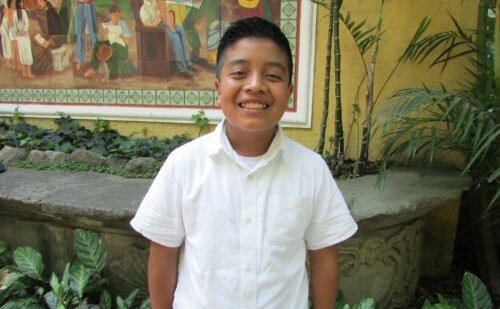 His goal this year is to do well in school because he would like to be an attorney someday so that he can help poor people with legal problems. Sugeidy lives with her parents and brothers in a 2 bedroom house built with laminate and block with a cement floor. Her mother is a housewife and her father works unloading trucks and earns about $125 per month. Sugeidy likes to play dolls with friends. Her favorite color is pink and she loves cats. Her favorite music is Reggaeton. Her favorite subject in school is learning shapes and letters. Her goal is to finish the school year with good grades. When she grows up, she wants to be a police officer to help people. Emily lives with her single mother and 3 siblings in a two room house built with sheet metal and with cement floor. Her mother works as a housekeeper and earns about $375 per month. Emily likes to play basketball and her favorite music is Romantic. She likes dogs and her favorite color is black. She wants to be first in her class this year and her favorite class is mathematics. When she grows up she would like to be a psychologist to help people. Barnabé (his preferred name) lives in San Lorenzo with his widowed mother and an uncle along with his two brothers. They live in a 4 room house constructed with wood and cement block with a cement floor. His uncle works when he can in agriculture or as a carpenter. His mother makes jewelry and table covers to sell on the streets to tourists. 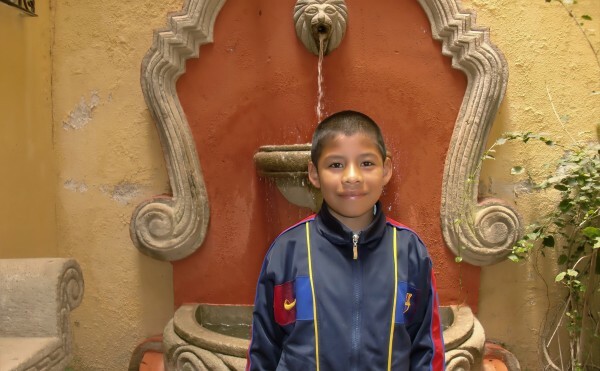 Barnabé is in the second and third grade at the Scheel Center, an accelerated school program where students with a late start can pass two grades in one year. He likes to play soccer with his brothers and friends. He also is learning to play the trumpet and wants to play it in church. Christian music is his favorite. His favorite color is blue and he likes dogs. 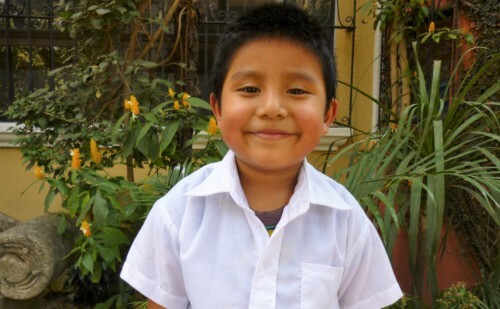 Someday, Barnabé would like to be a doctor so he can take care of his brothers if they are sick. 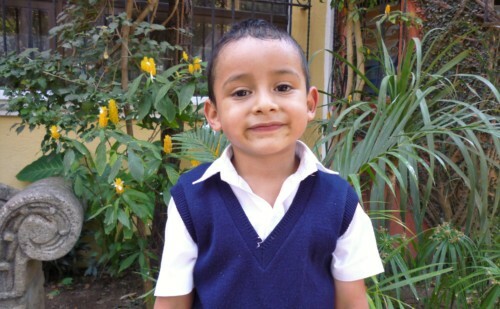 His favorite classes are communication and language and his goal this year is to be the best student in his class. Diego lives with his mom and three siblings; the house is made of tin laminate, wood and ceramic floor. His father works at a restaurant in Antigua as a cook and her mom works as a nanny earning about $223 per month. 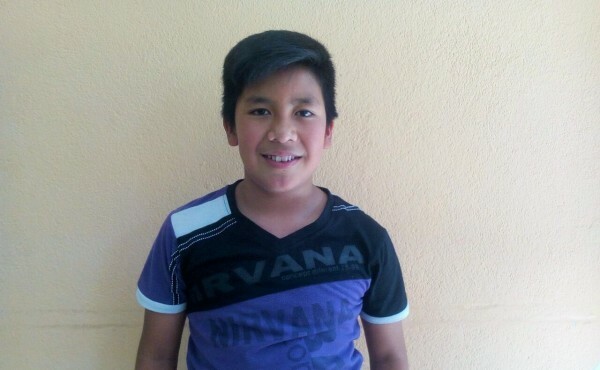 On his free time, Diego likes to play soccer and his favorite color is red. He likes reggeaton and his favorite class is music. His favorite pet is the dog and when he grows up he wants to become a mechanic because he likes cars. His goal for this year is to win the school year and learn more every day. 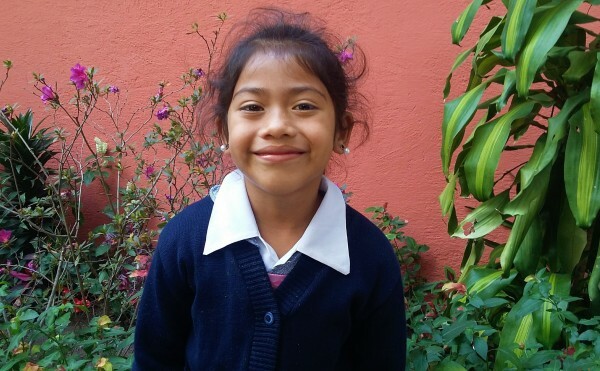 Jimena lives with her parents and three siblings. Their home has been made by one of our Service Teams and it belongs to them. Her father gives maintenance to a house as work and her mom is a housewife; he earns approximately $349 per month. Jimena loves to play with her dolls and her favorite color is black. She likes to listen to reggeaton and her favorite class is arts. 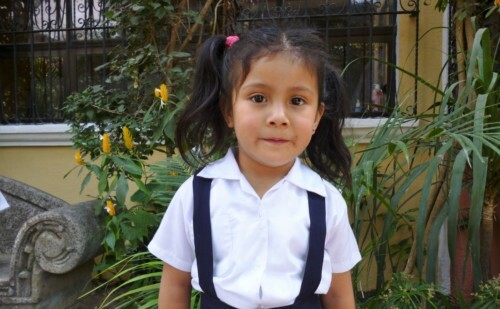 Her favorite pet are the rabbits and when she grows up she will like to become a teacher. 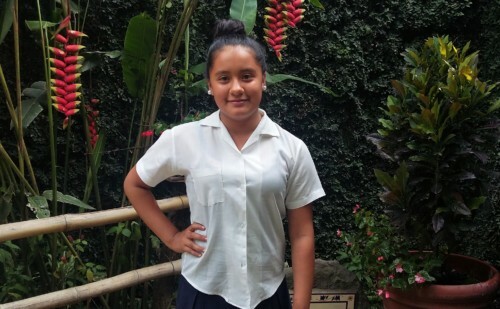 Her goal for this year is to finish the school year with good grades and learn more.